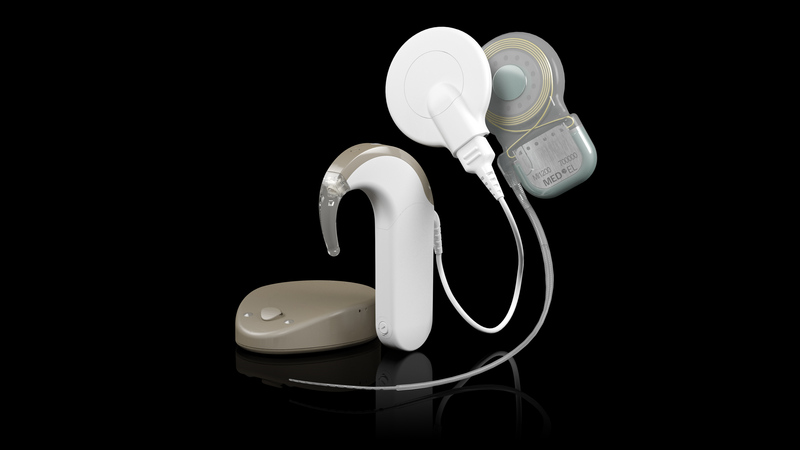 Here are some FAQs about the new MED-EL SONNET processor, SYNCHRONY implant, and WaterWear accessory for RONDO. The SYNCHRONY implant achieves its high 3.0T MRI rating (in currently approved countries) by the use of an internal magnet that can rotate due to the magnetic field of the MRI. The WaterWear accessory is intended to be used with rechargeable 675 batteries. In the ‘truth in advertising’ department, the FAQs says that the processor is the ‘smallest and lightest audio processor for cochlear implants.’ The thickness of the SONNET processor is listed at 5.9 mm. While the narrow ends of the bevel around the edge of the processor are indeed 5.9 mm, the body is 9.3 mm thick. Both the 9.3 mm thickness and the 56.7 mm height are greater than the corresponding dimensions of the competition. Dimensions are specified in this MED-EL document. This entry was posted in News and tagged cochlear implant, MED-EL, RONDO, SONNET, synchrony, WaterWear by CochlearImplantHELP. Bookmark the permalink.